When you think of New Orleans the thoughts automatically lead to Cajun food, jazz and Mardi gras. Still, it's hard to think of the Crescent City and not remember the horror of Hurricane Katrina and the aftermath of the floods. 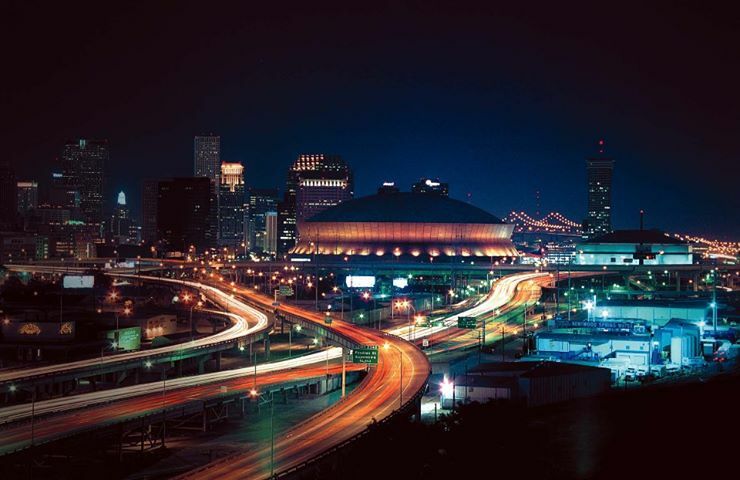 While some parts of the city are still rebuilding, New Orleans as a destination town and as a great place to hold your next trade show or event. Monster Displays is ready to make your event on the Mississippi and the Gulf of Mexico an outstanding trade show or conference. Give Monster Displays a call at (888) 483-3344 to get started on the plans for your next great conference or trade show. Custom exhibit designs, graphic banners, table top displays and more are available from Monster Displays to market and promote your next trade show experience, all of this is available from Monster Displays at a competitive price. Monster Displays can deliver the equipment and set up you need right to your convention site. There's no need to worry about shipping costs or set up charges when you can turn to Monster Displays to provide your exhibit and trade show needs right on location. Check out MonsterDisplays.com to get a good view of products available. You can shop for your trade show needs from the comfort of your office. Then with just a click of the mouse you can be on your way to your most successful trade show event. The New Orleans Ernest N. Morial Convention Center opened in 1985 and sits along the Mississippi River near New Orleans' famous French Quarter. Originally named the New Orleans Convention Center it was renamed in 1992 for the late Ernest M. Morial, the late mayor of the city who was instrumental in the construction of the center. A 3.1 million square foot facility awaits you at the New Orleans Ernest M. Morial Convention Center including a 60,300 square foot column-free Great Hall, the 36,448 square foot La Nouvelle Orleans ballroom and the 4,000 seat New Orleans There are 140 meeting rooms and 12 combinable exhibit halls. Located next to the Mercedes-Benz Super Dome and the New Orleans Arena was one of the most frequently used visual images of the destruction of Hurricane Katrina. The fully renovated facility re-opened in 2001. Located on the Mississippi Riverfront and just blocks from the French Quarter the Hyatt Regency New Orleans is close to all the action of this exciting city. The Hyatt Regency New Orleans has 200,000 square feet of exhibit space, including two 25,000 square foot ballrooms. There are 70 meeting and banquet rooms and total of 80,000 square feet of exhibit space. The Georgia World Congress Center covers 3.9 million square feet. Contained in that you will find 1.4 million square feet of exhibit space including 12 exhibit halls, 106 meeting rooms and 2 grand ballrooms. New Orleans has a humid subtropical climate. Winters are generally mild and short. Summers are generally hot, and humid. Very humid. Because of the low elevation of the city, New Orleans is at a high risk for hurricanes. Follow this link for information about current trade shows and conferences in New Orleans. New Orleans is easily accessible by air, rail, highway and water. New Orleans is a major U.S. port. New Orleans is served by the Louis Armstrong New Orleans International Airport. There are also several regional airports in the area. Amtrak serves New Orleans with routes from New York City on the Crescent. The City of New Orleans operates between New Orleans and Chicago. The Sunset Limited runs from Orlando through New Orleans en route to Los Angeles. Buses: New Orleans Regional Transit Authority (RTA) operates bus routes connecting the city and suburban areas. The Jefferson Parrish Department of Transit Administration provides service between the city and the suburbs. Trains: While the city is currently not served by a light rail system, the iconic New Orleans streetcars operate along the St. Charles line, the River front line and the Canal Street line. Tennessee Williams featured the New Orleans Streetcars in his 1947 play, A Streetcar Named Desire. Other: The Canal Street Ferry connects New Orleans with Algiers Point across the Mississippi. The city is connected to Gretna via a separate route. Because of the flat terrain, bicycles are a popular means of transportation in the city. Taxis are available at the airport and at most hotels. In post-Katrina New Orleans there are over 140 hotels offering more than 31,000 rooms. Major Attractions: There is no shortage of entertainment options in New Orleans. From the notorious Bourbon Street, to St. Charles Avenue to the famous French Quarter which dates from the French and Spanish eras, the casual visitor to New Orleans won't be able to take it all in with just one visit. Also worth seeing are the National World War II Museum, the New Orleans Mint, Jackson Square, St. Louis Cathedral and the Aquarium of the Americas. Major Entertainment: You don't have to be in New Orleans for Mardi gras to experience world class entertainment. New Orleans is a major city for musical influence with a mixture of Latin American, European and African cultures. New Orleans gave birth to jazz music as the only city in North America to allow slaves to gather and play music. Cajun, Zydeco and Delta blues are products of New Orleans. Traditional funerals in New Orleans feature jazz music. New Orleans also contributed to the birth of American rock and roll. While big name entertainment does come to town, some of the best music can be heard at clubs and festivals around town. In addition to Mardi gras, there's the New Orleans Jazz and Heritage Festival, Southern Decadence and the Tennessee Williams/New Orleans Literary Festival. Shopping in New Orleans: Shopping opportunities in New Orleans include the unique retail shops of the French Quarter and the French Market where some of the city's most unique and talented artisans display their craftsmanship to the Shops at Canal Place and the Riverwalk offering upscale shopping opportunities. Magazine Street is famous as a shopping destination but also features museums, art galleries and restaurants. Excursions from New Orleans: While there's plenty to keep you occupied in New Orleans, popular day trips include Baton Rouge with its proud Creole and Cajun heritage or Biloxi, Mississippi sitting on the shores of the Gulf Coast. For a day at the beach consider Grand Isle, a barrier island just a short drive from the city. To get a taste of the old south consider a plantation country tour to antebellum mansions that have survived for more than 200 years. The more adventurous can book a tour to the swamplands of the Louisiana bayou. Food & Beverages: New Orleans has a reputation for fine and exotic food that blends Creole, haute Creole and French Cuisines mixed with French, Spanish, African, Native American, Cajun, Italian, Chinese and Cuban influence. Not to be missed are the beignets at Cafe du Monde served with cafe au lait and the Bananas Foster at Brennan's. Then there are Gulf oysters in the half-shell, boiled crawfish, étouffée, jambalaya, gumbo and the favorite red beans and rice. Pralines are a New Orleans favorite made from brown sugar, cream, butter and pecans.